it’s been a few weeks since i’ve posted a formation friday. this is a crazy month for us at the refuge & my kids home for spring break & getting moving on the book & all kinds of other typical chaos. it’s been a really good lent at the refuge focused on “hunger.” one of the things so many of us hunger for is freedom and peace. we want to feel less crazy brain & more peace. less burdened & more free. less insecure & more loved. less burdened & more light. one of the parts about lent that i really like is the introspection and examining what’s going on inside our hearts a little more intentionally. for all kinds of reasons, this passage has been rattling around in my head for the past few weeks (somewhere along the line, my kids had to memorize it when they were at christian school and i can still sing the jingle): be kind and compassionate to one another, forgiving each other just as in Christ, God forgave you (ephesians 4:32). forgiveness is such a tricky thing for so many of us. letting go of deep hurts is much more than saying a verse or praying a certain prayer. releasing resentment is an ongoing process in our spiritual journey that is easier said than done. i think that’s why we need God’s help with it so much. left on my own, i can always come up with a really strong case why i am right, how i have been harmed, how deeply it hurts, and why i don’t want to let it go. some of my resentments are protections. they keep me safe & protected, my heart a little hardened; they guard me from vulnerability. unforgiveness also robs us of so much life. i like what anne lamott says, “not forgiving is like drinking rat poison and waiting for the rat to die.” we are the ones who suffer. oh, the hours i have spent harboring unforgiveness against myself & others that some never even knew existed. they didn’t lose one wink of sleep about it and i was tortured. i think that’s why Jesus called us to forgiveness so clearly–it’s not so God will be satisfied somehow, it’s so we won’t live in so much torment. it’s also quite true that forgiving does not mean forgetting. that is a false teaching that gets any of us right back into unsafe situations. to me, forgiveness means means letting go. releasing ties with the negative power it has over us. seeing our story through new eyes. acknowledging not only our humanness, but others, too. and respecting brokenness & evil & reality. offering mercy. i know there are a lot of really complicated situations out there. stories of abuse that simply writing a few lines in our journal will not immediately shift, but i thought that for this formation friday, and in the spirit of the last few days of lent, i’d share a little exercise that centers on forgiveness. we’re all at different places on this, so don’t feel any pressure. i noticed this week that i have been carrying some resentments that i had let go of but picked back up. i was reminded, yet again, how forgiveness is an ongoing part of our human existence and is a pathway to peace (the beatitudes & 12 steps are so good with helping us keep current). there’s usually always some work to be done in this area, no matter how big or small. the primary areas that forgiveness seems to fall into are: forgiving others, forgiving ourselves, and forgiving God. for some of us, forgiving others means letting people off the hook. they’ll never actually know how deeply they hurt us and will never ask for our forgiveness. but we can’t keep living like we’re living and it’s time to let go. even without the justice we desire. sometimes the hardest one to forgive is ourselves–all of the “if only i’s…” all of the ways we are so freaking mean to ourselves, so withholding of compassion and kindness. all the “how could i be so stupid’s?” all the noise that clutters our heads & hearts & steals so much life. and depending on our situations, sometimes forgiving God is necessary. one of the best things that ever happened to me was letting go of blaming God for everything but i have still had to reckon with how truly pissed off i am at the way things work sometimes. for others of us, we must address that God did not protect us properly and how bad that hurts. they look different for each of us and part of this exercise is to consider what rises to the surface during this season. who or what is giving us the most trouble right now? what can we not seem to let go of? what seems to keep rearing its head in a way that’s destructive? i think kindness or compassion toward ______ (a person, a circumstance, ourselves, God) might look like..
as with any spiritual reflection exercise, sometimes the time is right and sometimes it’s just not. my hope for this formation friday is not for it to feel forced but rather an invitation when the time is right. the lighter we can travel, the better. ← 10 ideas to re-engage with the Bible if we've become allergic to it. So true, but always such a challenge. Thanx for the journaling prompts. thanks for taking time to share, let me know how it goes! For a huge chunk of the first part of my life, the message I received about forgiveness was that it was basically like flipping a light switch. Someone did you wrong and you haven’t forgiven them? Flip the switch and forgive. Still having bad feelings about the person/situation? Still hurt and reeling from the loss? You must be harboring unforgiveness…you didn’t *really* forgive them that first time, so go ahead…flip the switch and forgive. Any sort of negative emotions or need to talk/process the events and the fallout were seen as signs of unforgiveness so all of those things had to be kept under wraps. That, of course, doesn’t actually work well, especially in the long run, because those sorts of things have a way of working themselves out into the open. Now I see that the on/off approach to forgiveness rarely works in reality. It is more like a dimmer switch. The light gets turned on initially and it can be quite a shock! We go about our business and then things get turned up a bit and we get to forgive again. Sometimes the forgiveness only clears the way for us to feel the pain of the loss we have experienced more deeply. The real, actual loss of friendships and safety and trust. And we get to forgive again. I love what you said about letting people off the hook even when they will never know how deeply they hurt us. It was so validating. I think that is another piece missing from the switch-flipping mentality of forgiveness; it has no room for validation. Or anger or grief. It tries to make it all neat and tidy, but forgiveness is neither of those things. Forgiveness is messy and difficult and it takes courage and resolve and a willingness to get our hands dirty in order to wash them clean again. And again and again. Thank you for writing this and sharing it with us, Kathy. So. Good. thanks lovely friend for taking time to share. the light switch is such powerful imagery and i so can relate to that teaching. craziness! and so hard because it just doesn’t work that way. our formulas just really don’t work and leave so many of us stuck and alone and ashamed for our lack of….you name it. i love this line “forgiveness is messy and difficult and it takes courage and resolve and a willingness to get our hands dirty in order to wash them clean again…” love. i hope i get to see you soon. That is very interesting Kathy that you shouls be writing about compassion “typical chaos” and wanting a “less crazy brain”. I’m having compassion therapy at the moment and I do meditation. Have you ever done similar or have you considered doing similar. I’d recommend it to anyone, along with the important forgiveness you talk of for achieving a calmer and more peaceful being. great stuff, adam, thank you for sharing the links. a practice that has helped me the most is centering prayer, choosing a word and meditating on it. it’s so telling, what happens in that process, and so powerful how much peace can come from it. a friend gave me a great compassion therapy technique that has been so helpful in acknowledging my pain instead of trying to push it down. That’s interesting. Good to hear you have been finding peace in what you have been doing. Simlarly, for me, meditation to begin with was painful. What it did in making things still for me with the centralitiy of Christ was illuninate areas of pain that had been held down. Not that I had intentionally being holding stuff down, but that it had been there in mu subconcious without me realising it. the work wiht the psychologist and with compassion therapy has then been used to address the pain which has been freeing. Well. You nailed me with the sentence “i have still had to reckon with how truly pissed off i am at the way things work sometimes”. This whole forgiveness thing is a lot of work, which, when I ask for help, is somewhat easier, but still work. Then there’s the tendency to take it back to handle myself. Thank you for the spiritual homework, maybe that will help me to focus and gain clarity and move forward, load lightened. Not sure how I found your blog, but ever so grateful. thanks so much for taking time to share, judy, and hope that it can help with lightening the load over time. And sometimes I feel strong enough to venture down into the dungeon of my soul. You all know that place. It’s the cold, dark, damp basement where we have imprisoned those who have hurt us. “How long have I held you here?”, we ask. “Twenty-two years, seven months, 13 days, 12 hours, and 47 minutes,” drones a a voice from the other side of the rusty iron gate. Even in the darkness we can feel the eye-roll of contempt from within. And as we watch them through a veil of tears walk back upstairs into the light, we want them to repent. We want them to feel sorry. We want them to see the suffering. No, more than that. We want them to suffer like we did. But we know that won’t happen. Not with this one. So we kneel, scrape up our guilt, our shame, our suffering, our need for answers off the floor into bucket and return to the top of the stairs. And as we head into the light, we hold the bucket up to God and ask that its contents be brought into the Light, bleached, purified, and made clean. Take this dirt and grow something new. Oh, Lord! Help me with this one! absolutely gorgeous. thank you so much for sharing, what a gift. that “..so we kneel, scrape up our anger…” paragraph, whoa. yes, yes, and yes. take this dirt and grow something new. please. God help us with this one! … and that was my sh*tty first draft (thank you Anne Lamott). I can’t wait to see where I am led to finish it up … if only the fears and tears would stop long enough to work on it. So good. I really appreciate how you acknowledged how in some complicated, abusive systems, it is just not all that easy. I distinctly remember a seminary professor that I had that taught a christian response to abuse or something like that class… and he would preach that helping someone heal from sexual abuse was simply not ever possible until the victim could fully forgive. I remember sitting there feeling so incredibly anxious, that any second he was going to see past my joking smile and desperation to keep it all together and stop in his tracks , whip around, and smell my unforgiveness. So I am a bit dramatic, but you get my point. Thanks so much Kathy. The walls of unforgiveness around my heart have kept me isolated too many times. I think I now understand what the greatest commandment ‘love your neighbor as yourself’ means. By forgiving others and myself, I am loving God and this beautiful life the best way possible. When I finally really forgave my Dad and let go and freed him there was initially great grief but then joy followed. Something in my heart changed …it was peaceful, freer, there was light. Funny thing about forgiveness: When we forgive, those we forgive (if they’re not still harming us), tend to lose their power over us. It may be the case, however, that those we forgive continue to harm us. In that situation we may need to put some distance (physical, emotional or both) between ourselves and those people (when possible). thanks, sam, yeah, that is so true and often the case. learning how to let go while also honoring healthy boundaries is so important and often we have been taught that somehow we are supposed to make something work that really can’t. that has been a big learning for me. 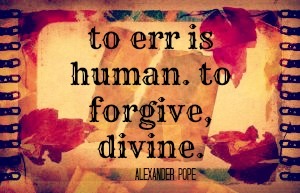 I wonder if we are ever done forgiving for a particular ‘thing’, person, or whatever. I am thinking that there is something to forgive in any person I have ever known. Boy, isn’t that a daunting thought! I have, over the years, forgiven my dead parents for ‘whatever’. I end up forgiving them for the same things over and over, not really remembering that I went through this exercise before. One day, I decided to write myself a note – On such-and-such a day, I forgave Mom and Dad for this-and-such. I carried it around in my purse for a long time. Perhaps it is still there. It was a great reminder that I did that. So if I or some other force was dragging up the garbage again, I had proof that I did this. But I do realize that all the work has not been completed. Oh that it were!